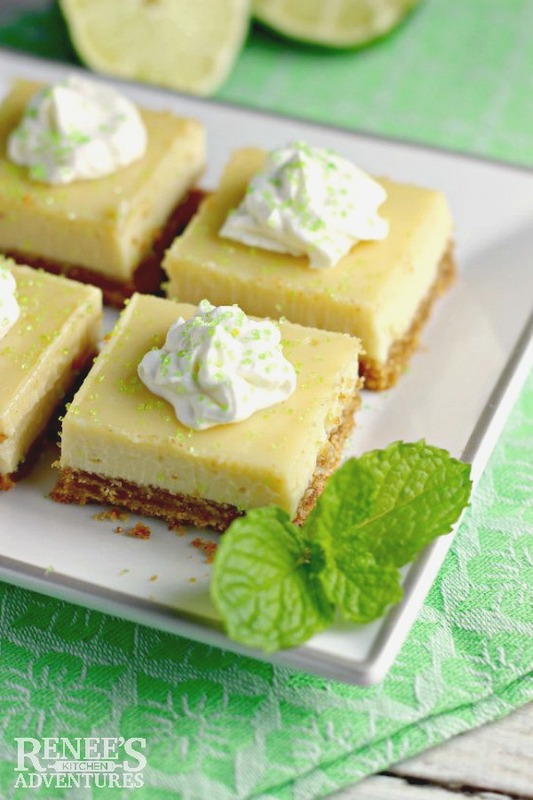 Easy Key Lime Pie Bars are an easy-to-make, easy-to-take dessert. Key lime juice gives the filling just the right amount of tart to balance out the sweet! Preheat oven 350 degrees F. Combine the crust ingredients (graham cracker crumbs, granulated sugar, melted butter and a pinch of salt) and press firmly into the bottom of a 13" x 9" baking dish that has been lightly coated with cooking spray. Bake crust for 8 minutes and allow to cool to room temperature. In large bowl, combine all filling ingredients with an electric mixer. Pour over cooled crust. Bake for 20 to 25 minutes or until filling is set but not browned. Allow to cool to room temperature and then refrigerate for at least 4 hours. Cut into squares and garnish with whipped topping and colored sugar or grated lime peel, if desired.